Well, I’ve been out of touch for quite a while now - so especial thanks to those of you who have made contact with me recently via the website mail page - it’s always great to hear from people who have read and enjoyed my books! The explanation for my prolonged silence is simple and fairly boring. I have been very busy working as what’s called a “Writer for Hire” - otherwise known as a ‘ghost-writer’. That is, I’ve been writing books for other people under other names. When you want to make your living from writing, you sometimes have to do this to pay the bills! To be honest, I really don’t mind doing writing-for-hire work - it can be fun, even if my name doesn’t appear on the cover. (Often, my name will appear somewhere inside the book under the heading: “Special thanks to…”). In case you’re interested, what happens with writing for hire is that you are approached by a publisher, who has a series on the go, and who needs the books to come out more quickly than can be written by a single author. So, they hire various people to write the books for them - these will always be experienced writers whom they know will produce good work on time and on word-count - and who will follow very careful instructions. For instance, I’m working on a book now that has to be 8,500 words long. I have a chapter breakdown, explaining the story scene-by-scene, and my task, in a fixed period of time, is to produce a ‘first draft’ of the book. Then, a few weeks later, I will get the manuscript back with a whole lot of changes that the publishers want. I then have to make these changes and send the 2nd draft back on time. Anyway, at the same time as working on that kind of stuff, I got together with a friend and colleague - a man by the name of James Noble - and we’ve been working on a new series together. We found an interested publisher in the UK - they’re called Little, Brown. For the past year or so, we’ve been honing the idea and plotting and planning and writing like crazy - and now, at last, the first book has hit the stores! 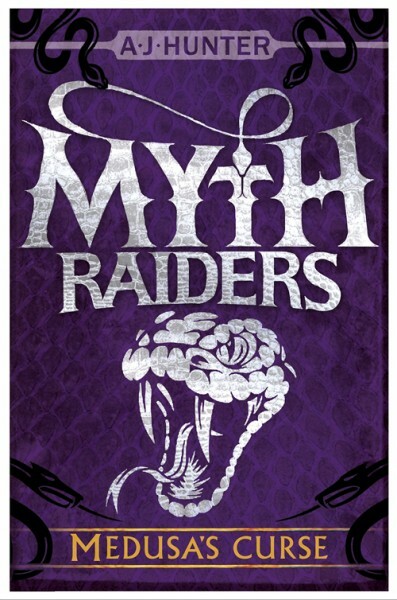 The series is aimed mainly at 8 to 12 year olds and is called MYTH RAIDERS. As usual, it has plenty of fantasy elements in it. The basic story revolves around two cousins - English-born Samantha (Sam) and her American cousin Trey. Trey is fascinated by archaeology and collects old artefacts, when he can afford it. He has recently discovered and bought a half-disc which was found on the east coast of Brazil. Sam’s mother is working in West Africa - and she has sent Sam a half disc discovered on the coast there - apparently quite old! When Sam goes to New England to visit her cousin for the summer, they compare discs and find they are the two halves of the same disc! How can that be, when they were found a whole ocean apart? Well, it turns out the disc was buried when the two contents formed part of a massive continent millions of years ago - before continental drift separated them. The disc is crazy old! Millions of years old - but it has carvings on it - it was made by a person!!!! That is weird enough, but when they put the two halves of the disc together, the cousins are sent back in time to the Mythic Times, where they encounter a very angry Medusa and her vicious harpies and a bunch of weird satyrs. Managing to scramble home again, Trey and Sam are confronted by a man who appears out of nowhere. He introduces himself as Michael First Lord of the Light - and explains that they are the Chosen Ones - warriors of the Light whose task is to find the lost pieces of the Shield of Light in order to fend off the attack by the Lords of the Dark. The pieces of the shield have been lost in the Mythic Times -and Trey and Sam must go back there to find them. And thus, the cousins set off on their adventures. Book one takes them to Ancient Greece, book two sends them into Egypt at the time of the Pharaohs, book three sees them in Tang Dynasty China and the fourth book is set in Babylon at the time of the Hanging Gardens. Well, thats what I’ve been up to! And now, with Myth Raiders almost finished, James and I are about to embark on another idea. I’ll keep you posted. The first book is already available online in America, and in shops in the UK. It is called Myth Raiders: Medusa’s Curse. Because James and I have worked on this series together, we came up with a joint name for ourselves: A J Hunter. So, look out for Myth Raiders by A J Hunter. As I say, book one is already out there - book two will be published in May and book three in the Autumn. Since my last post, I have been re-reading the Faerie Path books. I still have my fingers firmly crossed that I’ll find the time to write the wrap-up short story that I’ve mentioned before - the short tale that will (with any luck) tie up all the loose ends left dangling at the end of The Charmed Return. Believe it or not, I haven’t looked at the six Faerie books since they were published - which means I haven’t cracked the first book for some years now. I have to say, I’m rather enjoying the process of reading them without having to worry about what to change and what could be done better etc. All too late for that now - so I’m just getting into the stories again. My new American Literary Agent has arranged for me to get my own page on the online Encyclopaedia “Wikipedia” - so if you go to their site and type Allan Frewin Jones, you’ll see me up there. There’s no picture of me yet - the rules mean the photo has to be taken by a ‘third party’ - meaning I can’t use a photo I’ve had taken - so we’re still looking for something that fits the Wikipedia rules. Apart from that, nothing new to report yet. We’ve had the first good summer for 6 years over here in England - but Autumn is creeping towards us now and I’m really looking forward to a Winter in our new home - with central heating. By the way, just to explain again the Faerie Path situation for all of you who would like a 7th book. The problem is that I do not hold the copyright of these books. This means I cannot write another book without the permission of the copyright holders. The copyright holders will not authorise another book unless they have already got a publisher interested. Right now, no publisher is interested in a 7th book. There’s nothing more I can do about this - but I can post a ‘freebie’ story about Tania and the others online on my website - so long as I can find the time from making a living to actually write it. Here’s some potentially very good news. I have just signed with a California-based Literary Agency. This is the first time I have had representation in America, and I’m really excited about it. It all started when my collaborator and friend, illustrator Gary Chalk started tweeting with an American blogger @BookaliciousPam. Some years back, when The Faerie Path and Warrior Princess books first came out, Pam wrote glowing reviews of both series. Gary didn’t know anything about this, and it was only when he tweeted that he would be in California for a few days this September, that Pam told him she was now a literary agent and asked if he’d like to meet up for lunch. He said he would. Now, Gary and I have been coming up with new book series ideas for some time without managing to get any UK publishers interested, so lunch with an American agent seemed like a very good idea. They met, lunched and Gary signed up with Pam’s Agency: Foreword Literary. Meanwhile, Pam emailed me and asked if I’d like to Skype with her to talk over the possibility of me signing with her as well. I said yes. I had to get up at 6.30am because of the time-zone difference (California is 8 hours behind the UK). It was 11pm in San Jose, and Pam was there in PJs, with a glass of wine and a black kitten called Loki God of Mischief. We had a really good talk, and I signed up with Foreword Literary the same morning. You’ll find a link to their Website on the Home Page, if you’d like to check them out. Gary and I have already given Pam a few of our ideas, and she’s very hopeful that we’ll get something rolling very soon. I’m still reading through The Faerie Path books in order to get my creative head in the right place to plot out my proposed final short story tying up all the loose ends of Tania’s adventures. Fingers crossed that I actually get the time to write it! first of all, apologies for not writing anything here for a while - I got caught up with other things and kept putting it off and off. In fact it was Claudia who said - hey, you haven’t written anything for months. That spurred me on. In my defence we have also just moved home. If any of you have moved home, you will know how much time that all takes. 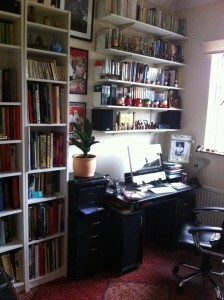 Claudia and I now have a very nice house in Kent, and I have a brand new study in which I can do my writing. The picture shows my desk and a few of my book shelves and book cases - there are plenty more - and I still have to sort out all my books, which got randomly shoved onto shelves shortly after the move, just to get them out of the cardboard boxes. Anyway - most of my time has been spent recently on my new spy-boy series for the UK - Codename Quicksilver. I think the books worked really well and I’m very pleased with them. My other series, The Six Crowns, which I co-wrote with illustrator Gary Chalk is still being published in America - book five of the series: Sargasso Skies, was released in July. Reviewers are saying the series is like Redwall meets The Lord of the Rings - which is great! That was pretty much the idea we were going for when we came up with the series. Some of you will remember that I promised to write a short story to be posted on this blog - a Faerie Path story that would tie up all the loose ends left at the end of book 6. Well, I’m still hoping to get that done all these months later. The real problem is finding the time to write something just for love - I know a lot of you were really looking forward to this story a while back - and hopefully you still are. First of all, I’m going to re-read the entire Faerie Path series so I can get myself back into that world, then I’m really hoping to get writing - very soon, if all goes according to plan. I’ll keep you updated more regularly now, I promise. First of all, my apologies to people visiting my site over the past few months and hoping for some kind of update. As a writer who has to make a living from my work, I’ve had to move on to other projects over the past few months, and these new book series have been taking up a huge amount of my time. I do read all emails and comments from readers, and when you write directly to me, I always respond…but it’s been difficult to find the time to write a new Blog recently. I still get emails and comments from readers of The Faerie Path and Warrior Princess begging me to write more. I would be happy to do this, but the publisher has made it clear that for the foreseeable future, they have other books they want to publish and continued books of The Faerie Path and Warrior Princess series are not a priority for them. The other point I do need to explain is that I do not hold the copyright to these series. This means I cannot go away and write more books without the permission of the publishers - not even online books, as some of you have suggested. I do still have the hope that I will find the time to write the Faerie Path novella that will take the story up to the wedding of Tania and Edric, but as I said above, I would need to do this is free time when I was not making a living, because all I could do is to make it available free for people coming to this site. As for Warrior Princess/Destiny’s Path - I only ever planned on four books in this series - also, although the potential for more adventures exists, I have not thought through what these might be even if the publishers did ask for more. (Actually, I do have a few ideas, but - see above - the publishers are not interested right now). I was asked about ebook format copies of the fourth Destiny’s Path (Warrior Princess) series: Caradoc of the North Wind. I went on Amazon.co.uk and it is available on Kindle there. I think its just a case of searching the internet to find it. The book is certainly out there. Lastly - and maybe some of you will be interested in this - I come to the ‘lost page’ of The Charmed Return. Here’s the thing. When I first sent in the manuscript of the 6th Faerie Path book, it had a different ending - an ending that took the story on for another page. The publishers did not like the ending as it was, and asked me to take out the final page. At the time I thought maybe they had a point, but with hindsight, I think I should not only have left the last page in, but extended the book by a few chapters to give answers to the questions many of you have been asking. Too late for that now, sadly - but I do think it was a missed opportunity and I apologise for that. Anyway - the missing page still exists. Would anyone like to read how the sixth Faerie Path book originally ended? I’m going to warn you in advance that it is ONLY one page - but I’d be happy to make it available on this site if enough for you are interested. If there is an interest in this, I also have two full scenes from The Immortal Realm that had to be edited out because the book was running too long. I wonder if anyone would be interested in reading these ‘lost’ scenes? As for other work - I am in the very earliest stages of planning a new series with a strong fantasy element. I’m plotting this out with my friend and colleague Gary Chalk, and we’re hoping to have something for publishers to look at in the next few months. That’s really all I can tell you at the moment. Anyway - please let me know if you’d like me to post the lost page of Faerie Path. I hope everyone is having a great summer. Claudia and I are going to the Greek Island of Kefalonia in 12 days for two weeks of sun and sea. I’m really looking forward to it - this year the Summer in Great Britain has been dreadful. Grey and wet. Yuk! A little while ago I received the following email from a reader of The Faerie Path series. Emma asks some questions about ‘what happens next’ - and I would be very interested to hear from you people about which questions you would like answered. Also, are there other questions not covered by Emma? Good news at last. My copies of Destiny’s Path: Caradoc of the North Wind have finally arrived. I am gong to start mailing the books out to the winners of the competition in the next few days, but remember that the books are coming from London, England, so if you live in another country, you may have to wait a couple of weeks before your book arrives. Isabel from Germany, Amanda from Texas, Alexandria from Milford, Jamie from Australia, Ingrid from Champaign, Carolyn from Maple Grove, Brittany from Windsor, Emily from Singapore, Alyssa from Ashburn, Sarah from Marblehead, Celine from St Charles, Taylor from Olive Branch, Laura from Innisfil, Tayler from Southaven, Theresa from Houston, Sumayyah from Houston, Megan from West Seneca. If you sent in answers and were told you had won, but you are not on the above list, please get in touch. Otherwise, happy reading when your book arrives. It’s one of my favourites. For anyone else, you should be able to find the book online somewhere even if it is not published in the country in which you live. This is just a quick blog to let you know that the Destiny’s Path: Caradoc of the North Wind competition is now closed. The winners have all been notified - or they should have been. If you sent in an entry before the 14th of April, and you haven’t heard from me, please write again, otherwise, I’m sorry, but all my spare copies have now been won. American readers of Warrior Princess - which is what the Destiny’s Path series was called in America - should be able to buy copies of the 4th book on import, or it is also available on Amazon.com as a kindle edition, for those who are up on the new tech. There was some confusion in the book warehouse about my address - which is why I have not yet received my copies of the book. They were trying to deliver to a house four doors down the same road, but because they didn’t get an answer they sent the books back. This has all been sorted out now and I am expecting the books on Monday 16th or Tuesday 17th April. As soon as they arrive, I will begin signing and mailing them out to the winners, but please remember that the books are coming from London, England, so if you live in America or anyplace other than the UK, you should expect to have to wait two or three weeks for the book to arrive. I’d just like to say thanks to all of you who sent in the answers - if I’d known you were all so knowledgeable on the series, I might have made the questions a little harder!